An Outdoor Movie Night is a fantastic, family-friendly event that has the potential to be a significant fundraiser while providing a wonderful evening of entertainment for your entire community. There are many companies specialising in providing the full outdoor cinema experience including the large outdoor screen, sound systems and even the movies to be shown, making it a very easy event to put together. By outsourcing to a specialist outdoor movie company, your club’s profit will be reduced but the club will avoid issues such as copyright infringement. This is also the type of event that you can run multiple times to create a “season” of movie screenings and in the process securing your club an ongoing fundraising revenue screen. If a member at your club owns a projector, this could also be a low cost option but copyright laws will need to be researched and adhered to. Why an Outdoor Movie Night? An outdoor movie night is a relatively low stress fundraiser that can be easily used in conjunction with other fundraising ideas such as raffles, auctions and pie/pizza nights. The key activity (watching the movie) is taken care of and hopefully, if a great movie is chosen, is entertaining! It is important to be aware that this fundraiser does call on your club community to donate and doesn’t give an great opportunity for fundraising dollars to be made from external sources. This can be lessened by allowing your members to bring friends to the night. It is important to take into account the weather when planning your outdoor movie night and holding it during the warmer months is a great idea. You may like to link it to a milestone game/match as a celebration or could consider holding it mid way through your club’s year to break up the season. It could also be put in the calendar as one of the major, yearly social events or an ongoing monthly event at the club. Decide a date for the outdoor movie night fundraiser. Organise the venue or screen and projector. Organise any food and beverages that will be for sale. Organise any raffles or auctions that might run at the same time. Ensure the cinema or projector and screen are ready to go. Brief Volunteers of their roles. It is important to engage your members to help in the running of your fundraiser. You could also approach current club sponsors for prizes. You may like to consider using technology to reduce the workload on your volunteers and increase your fundraising dollars. For an event like an Outside Movie Night, you may like to sell tickets using a platform like TryBooking. 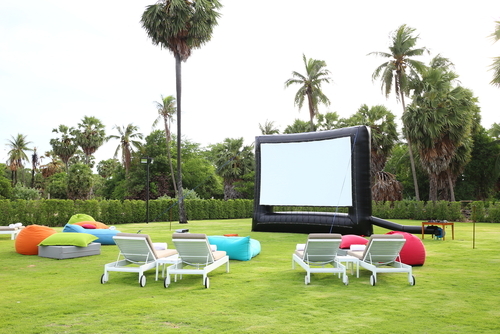 Outdoor Movie nights require moderate time and effort as well as upfront expenses, so clubs need to be confident the event will provide a return on that investment. Clubs could consider circulating an “Expression of interest” email to members to judge the level of interest within their community before committing to the event. The upside of making a movie night a regular part of the club calendar is that there is the potential to raise significant funds across a season. The potential profit of this event will be dictated by the location and format. The most profitable format is if the event is run onsite by the club itself but that format does present challenges around copyright laws. There are also equipment hire costs to take into account, although most clubs have members who have access to projectors and big screens. There are some cinemas that have outdoor options that you may like to consider. When run from an official cinema, there will be less revenue raising opportunities as the cinema provides most of the services, but on the plus side there is much less of a load on volunteers and no regulation red tape. It is also important to create a budget for the event and identify how much cash you will need before the day. For a Outdoor Movie Night there could be deposits required for the cinema or projector. It is a great idea to encourage your club community to bring their friends for a fun night out! The more people that attend the greater the opportunity to raise even more fundraising dollars for your club. To gain community attendees your club might like to consider contacting local radio stations or local newspapers. As an outdoor movie night event may also double as a social event at your club, you can use social media to build excitement. You can use social media to sell tickets and countdown to the day. You can also live stream parts of the event on the day so that those in your community that can’t attend can still be part of the event. It is important to consider whether your club will allow the sale of alcohol at club events. Events can be alcohol free or limits or restrictions set in advance. Clubs need to consider how they will manage the risks of binge drinking as well as the Responsible Service of Alcohol. There are obvious financial risks if enough tickets aren’t sold and cinema or projector costs more than is made. The health and well-being of those who attend your event should be a focus at all times. It is important that your club takes time to consider all possible risks and how to minimise these. Clubs need to check with their state or territory regulatory body to make sure they have all the required permissions to run an outdoor movie night. One of the main advantages of holding a movie fundraiser at a outdoor cinema is that you won’t have to worry about licenses and permits. If you plan to hold an outdoor movie night at your club, and serve food and alcohol, you will need to make sure you have all the required permits and do not breach copyright and distribution laws in regards to screening the movie. It is illegal to show a film in public without the appropriate rights so make sure these are covered in your agreement with the an outdoor cinema provider you may use. When held at a theatre, they will cover these factors in their normal course of business. To ensure you abide by the copyright laws check www.copyright.org.au. It is also important to contact your insurance company to ensure your public liability insurance policies cover the event. Council services you would otherwise have to pay for (e.g provision of rubbish bins, toilets etc) or for advertising to the community. Most clubs, as soon as they decide to have a function, automatically nominate their ground, facility or clubrooms as the venue. If you club’s located next to a community oval with a large grassed area for people to watch the movie and participate in other activities and amenities as well as ample parking, then perfect. If your club is not located at an oval, your club may wish to consider less obvious choices. An outdoor cinema night lends itself to the creation of not only general admission tickets but to also having “gold/premium class” and corporate ticketing options. “Gold” tickets could include food and drink options, the best seating positions and even providing comfortable seating for the movie. It is easy for your club to create a “gold” or premium ticketing option that will allow a premium price to be charged. Your club might also consider selling corporate tickets. This is a great event for companies to bring their clients and customers. It shows the host business supports local community events while providing a great networking opportunity for the host business. A corporate ticket could be created by packaging together a large number (10+) of Gold/Premium tickets together. An important feature to build into the corporate tickets is that the corporate host requires a semi separated area that allows them to network with their clients/guests. A new release movie with broad appeal is what you’re after. If children are attending the event then careful selection of the movie is required. In fact, defining the market and picking the right flick is one of the most important steps to ensure you get a large amount of people wanting to attend. If you hold your movie night at a theatre then revenue opportunities are more limited. Setting your own ticket prices to raise funds is one method and you could also hold a raffle just before the main feature.